Today, at every turn we hear the wail that any expression of Christian/Jewish religious belief in connection with any public event or on public property is a violation of the constitutional principle of “the separation of church and state.” However, this is not a constitutional principle; it is based upon a misapplication of the phrase lifted from Thomas Jefferson’s letter to the Danbury Baptists who had written him of their concerns about the state establishing one particular Christian denomination over all others. “Had the people [the Founding Fathers], during the Revolution, had a suspicion of any attempt to war against Christianity, that Revolution would have been strangled in its cradle. At the time of the adoption of the Constitution and the amendments, the universal sentiment was that Christianity should be encouraged, but not any one sect [denomination]…. It wasn’t until the case of Everson v. Board of Education in 1947 that Justice Hugo Black, writing for the majority on the Supreme Court applied this phrase as it is currently misused. So here’s the flip side of the “separation of church and state” coin for you liberals. 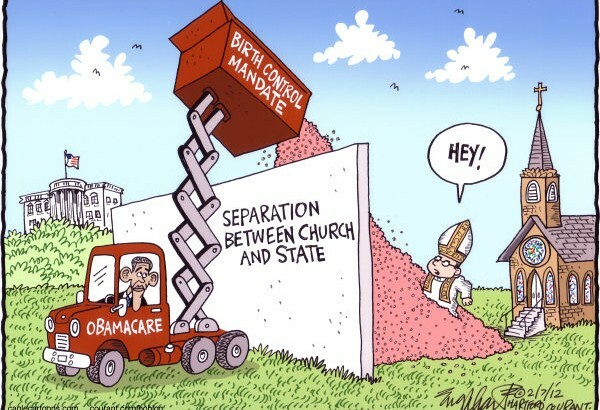 If the church cannot inject itself into the public arena because there is a so-called “wall” between them, then that wall works both ways – the government has no right to inject itself into the beliefs of the church. Liberals are quick to seize on idea of an establishment of religion (erroneously, I might add), but they are blind to the second part of the phrase, namely that “Congress shall make no law…prohibiting the free exercise thereof.” If the government regulates matters relating to the practicing of the beliefs of a church or of individuals, then it is “prohibiting the free exercise thereof” and is in violation of this principle. Of course, this is applicable only at the federal level, not the state, but what is happening in Iowa will most likely soon become the rule at the federal level as well, and then we will have a constitutional issue at stake.